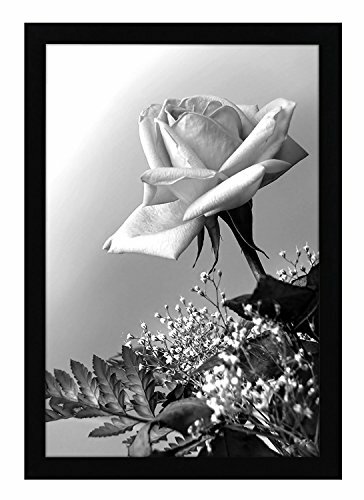 12x18 Black Picture Frame with Plexiglass Front - Your posters will look AMAZING! 1. The frame displays a 12x18 inch poster with easy-open tabs at the back let you load the poster quickly and easily. 2. The plexiglass front protects and preserves your poster. Removable film is added to the plexiglass to prevent any scratches during transit. Remove this film to reveal the crystal clear plexiglass beneath. 3. The elegant and stylish frame is highly durable. The frame comes with hanging hardware that's easy to install. 4. This frame is incredibly versatile. You can use it to display your favorite posters on the wall of your home or office. All you need to do is click the button at the top of this page to have your very own Americanflat picture frame rushed straight to your door. Don't just leave your photos on your cellphone! Order your Americanflat frame now and join thousands of other satisfied customers who LOVE Americanflat picture frames. STYLISH DESIGN: Ideal 12x18 inch poster frame for your home, office, studio or gallery. Beautifully display posters and art with this sleek designer frame. ATTRACTIVE LOOK: Plexiglass front gives a crystal clear view of your poster. Upon arrival, please peel off the protective film from the front and the back of the plexiglass. Posters and pictures in this frame will stand out when you hang them on the wall. HIGHEST QUALITY MATERIAL: This decorative poster frame is made of durable wood and comes with easy-open tabs at the back for quick and convenient access to insert your poster. This frame comes ready to hang with built-in sawtooth hanger. STURDY DESIGN: Constructed with high quality wood composite material that is built to last. There are additional reinforcements at the corner joints for extra support and sturdiness. PROTECTIVE PACKAGING: Americanflat developed exclusive proprietary packaging that helps ensure safe delivery of fragile and glass items. Order with confidence, click and add to cart today!